Personalized Money Clips, Custom Engraved in Bulk. Promotional, Inexpensive, Golf theme. 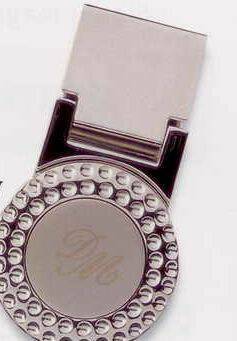 Bulk deluxe Metal Silver Satin money clips look like jewels. Packaged in individual cardboard box. Laser Engraving included. Free artwork design. Budget Prices in the USA, Canada for wholesale custom engraved money clips. American clients pay no taxes, Canadian clients don`t pay PST. Prices include Laser Engraving. Please contact us if you require other quantities or more details. Estimated Production: 7-10 days after art approval; contact us for faster delivery. Imprint Area: 5/8" diameter - laser engraving.